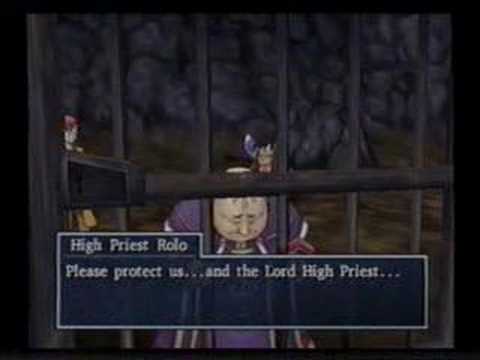 I’ve tried several times, but still haven’t managed to beat Rhapthorne, the final boss in Dragon Quest VIII. At least I’m pretty sure this is the final battle (not counting post-game bonus content); I already beat him once in the Black Citadel. I’m not sure if there’s anything I can do differently. I did a bit of leveling up, but that seems to be of limited use once you reach a certain point. I get the impression a lot of it is luck, because if he pulls out the meteors or the heavenly attack, those do a LOT of damage. I’m especially screwed if Angelo dies, because he’s the only one who has a guaranteed way to revive the dead. The thing is, once you get to the final boss in a game like this, there’s not much else you can do instead. There is the monster arena, but again, I’m not sure how I can beat a Class A battle. I figure you need to do that in order to recruit Morrie, so I still haven’t done that. I do have Red in my party, but I haven’t really used her because I’m so accustomed to the original quartet. I do like her voice, though; it’s hard to go wrong with sassy English accents. I’m sure I’ll get back to it eventually, but for now I’m taking a break. Still, since I’ve played through most of the game, I might as well write a bit about it. If you want to see what I wrote when I’d just started playing, it’s here. One thing I noticed is that, in some ways, the game is actually more forgiving than others in the series. Usually, when your party is wiped out, the leader will be resurrected, but it’s up to you to revive the others. While generally just a nuisance, it can be a real hassle early on when you have little money and no reviving spells. In this one, your entire party comes back with full hit points. You still lose half your gold, though; and while there are banks where you can store money, you don’t come across one until after you get a ship. Also, while the Zoom spell usually only takes you to towns you’ve visited before, in 8 it can take you back to dungeons as well, which means you don’t have to walk there multiple times. And when you level up, you’re also restored to full hit points, not something that happens in other DQ games. I don’t know whether these changes appeared in the original PlayStation version, but they’re in the 3DS one, and they make things easier. And there are roads to most significant locations, so it’s less difficult to find your way around or figure out where to go next. It’s typical in the DQ games for the main boss to not really do much until later on, and they’re often not even mentioned for some time. 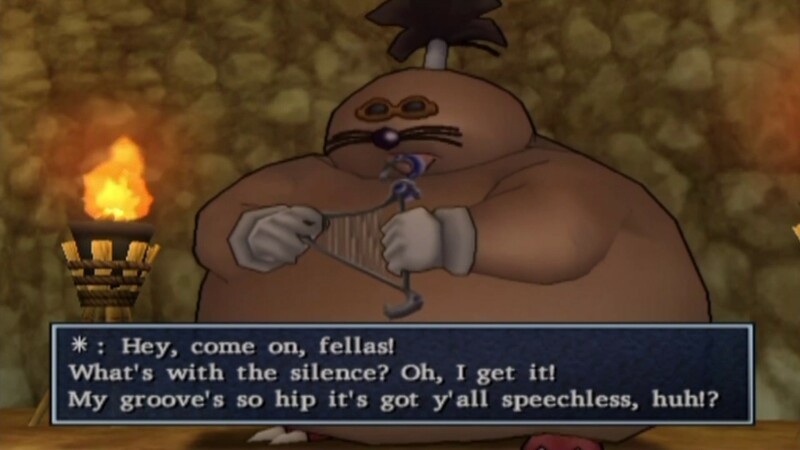 There’s no mention at all of Malroth in DQ2 until you fight him, but that’s immediately after fighting the boss you know about from the beginning. Well, there’s an item called the Eye of Malroth, but that’s only in the NES version; it’s called the False Idol or Evil Statue otherwise. 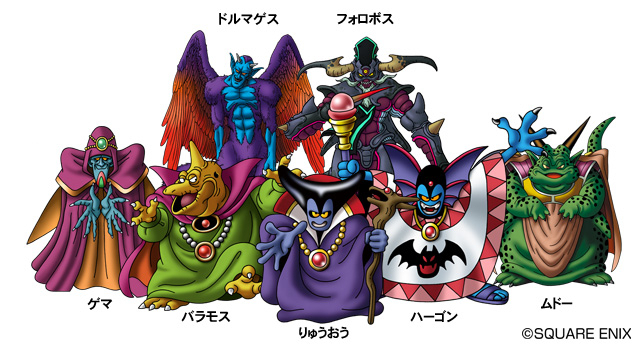 DQ3 sets up Baramos at the main boss, but it turns out there’s a greater villain in Zoma. DQ6 does kind of the same thing with Murdaw, although so much of the world is left unexplored when you beat him that you know you’re nowhere near the end of the game. In 3, you go to an entirely different world after beating Baramos, so it’s a more effective surprise (although I already knew about it from Nintendo Power). 8 is more like 6 in that respect, in that you spend the first part of it chasing after Dhoulmagus, but you kill him before you’ve seen the whole world. It turns out that he’s under the control of Rhapthorne, who was sealed inside a staff that the jester steals from Trodain Castle. 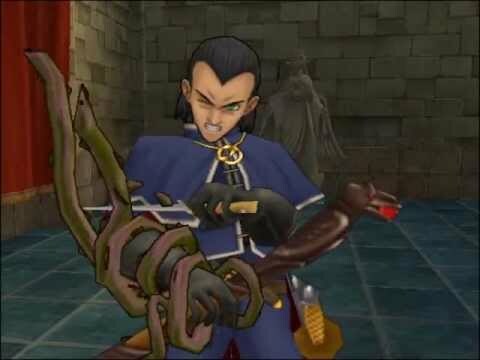 After you defeat Dhoulmagus, you find out that the only way Rhapthorne can be released is to trap the spirits of the descendants of the seven sages who originally sealed him away in the staff. So you seek out the other descendants, but they all end up being killed anyway. 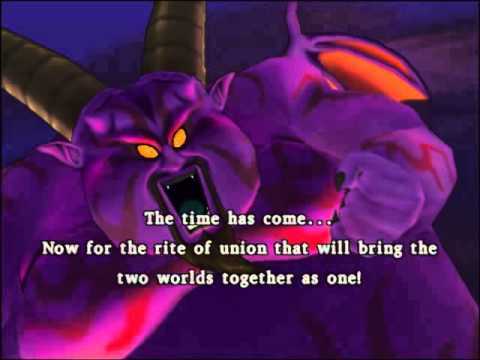 It’s one of those situations where you know from early on that the villain is going to temporarily succeed, like how there’s no way to stop Golbez from gathering all the crystals in Final Fantasy IV, or how it was pretty obvious throughout Infinity War that Thanos would obtain all the Infinity Stones. It makes that part of the game a bit frustrating, but role-playing video games always have to give you some reason to explore the entire world. An interesting aspect is that Rhapthorne possesses anyone who holds the staff. 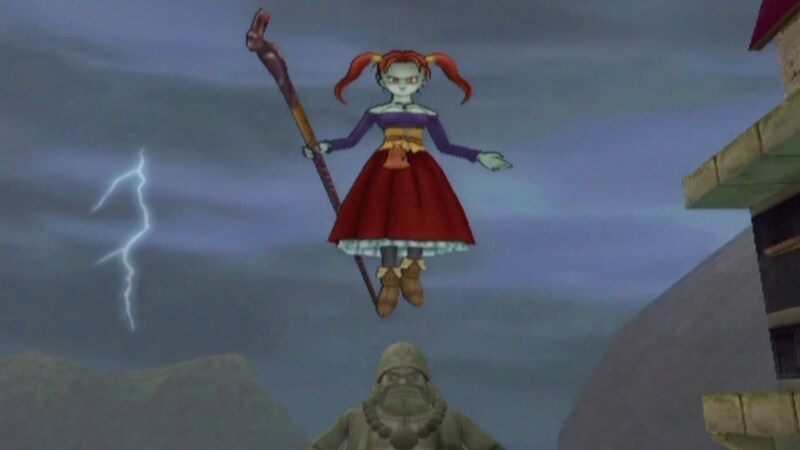 After you defeat Dhoulmagus, he takes over Jessica, and you have to fight her with your remaining party members. As is typical, she has a lot more hit points than when you’re controlling her. Then the dog Sir Leopold takes it and becomes a flying hellhound. Finally, before Rhapthorne shows his true form, Angelo’s even more arrogant brother Marcello is controlled by him for a while, although he’s willful enough to stave off the possession for longer than the others. This scene was actually censored a bit for the 3DS version, due to standards having changed in the intervening years. Dhoulmagus is said to have already been pretty nasty before being possessed, but he didn’t start murdering people until Rhapthorne took control. 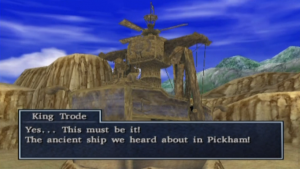 Several of the places appearing in this game are pretty typical of the series and the genre in general. You have your town of thieves, a casino town, a place with friendly monsters, a pirate hideout, and a frozen tundra. There’s no desert town this time, although you find a ship in a desert. And while there are churches throughout the series, the church organization is more significant and more corrupt this time around. Members of the clergy sell indulgences, betray each other in order to gain power, torture prisoners, and maintain a brutal penal colony. That’s not to say all the priests are bad by any means, just that the more sinister aspects of religion are somewhat in play here. The tundra area is Russian-themed, while the people in the casino town of Baccarat have American accents, and the hidden land of Empycchu seems somewhat South American (although I don’t know that their greeting “Gojoshar!” resembles any real language). There’s also a parallel dark world, although you explore only a small part of it, unless it features again in the post-game. As usual, you get your own ship partway through the game, and flying transportation much later on. In this case, the latter is a sacred bird, much like in DQ3 (in fact, I think it’s eventually revealed that it’s the same bird). The flight controls are a little more realistic than usual, and I have some trouble with them, especially as the map never seems to really show where you are while you’re in the air. 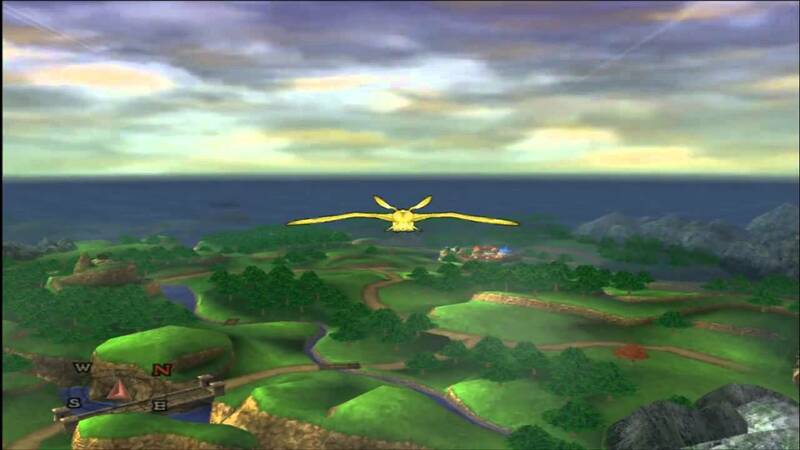 Unlike in the previous few games, there’s no intermediate transportation with limited powers of flight. You can also summon and ride sabrecats after befriending the cat-loving Felix. Some of the more notable sub-quests include visiting the mystical Moonshadow Realm, chasing thieving moles who mostly just say “Dig Dug” and have a ruler who fancies himself a hip musician, and helping a spoiled prince fulfill his rite of passage by killing giant lizards. 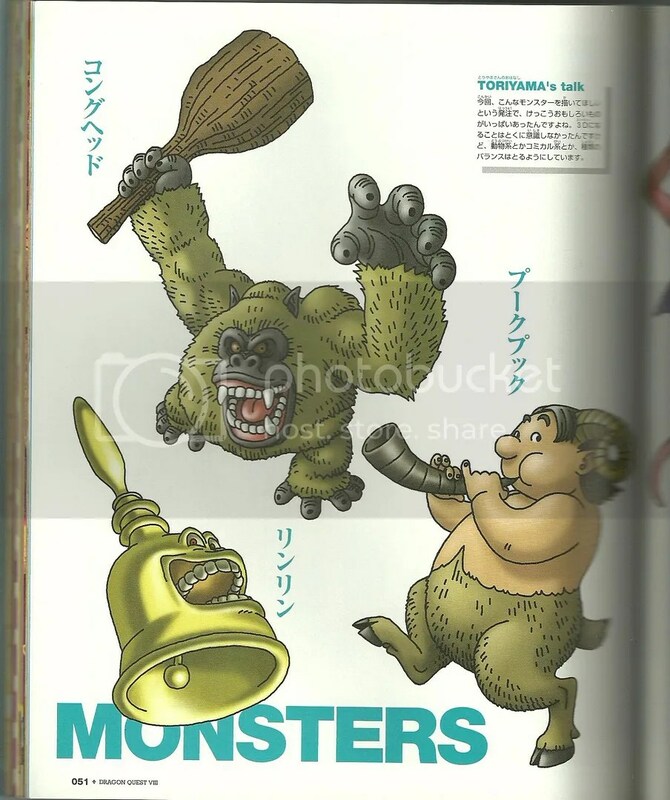 There are also a lot of different sorts of monsters, most of the familiar ones plus some amusing new ones, even fairly early on: cats based on the Cheshire one, puppeteers who put on shows to affect your party’s mood, satyrs who play pipes, cute little squid who sometimes draw instead of attacking. 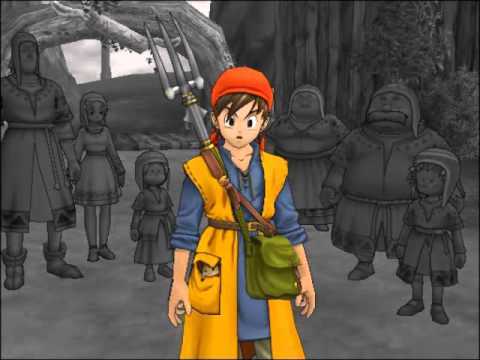 The world doesn’t seem as big as it does in previous games, particularly DQ7, but there are more distinctive characters. It’s also kind of darker than many, what with all the people who die for good. Then again, DQ5 has your father brutally killed right in front of you. There are a few other things I wanted to mention, like the alchemy pot, the camera challenge, and some more detail on the monster arena, but I think I’ll save them for a later post. This entry was posted in Animals, Dragon Quest, Focus on the Foes, Magic, Monsters, Religion, Video Games and tagged angelo, baramos, cats, demons, dhoulmagus, dogs, don mole, dragon quest ii, dragon quest iii, dragon quest v, dragon quest vi, dragon quest vii, dragon quest viii, empyrea, jessica albert, malroth, moles, morrie mozzarella, murdaw, prince charmles, rhapthorne, sabrecats, satyrs, sir leopold, zoma. Bookmark the permalink. Try making Resurrection Staffs for the whole party, and always keep an eye on everyone’s life status. Although Rune Staffs give you points-free Kabuff spells, don’t spend too many turns using them, as Rhapthorne can wipe them away with a wave of ice.